UPDATE: Apparently Amelie Rorty has just agreed to speak at the conference. The new doll is decked out in black spangled leggings and a lime-green fitted tunic patterned with binary code, worn under a slinky waistcoat, with saddle-stitching detail. The ensemble is topped off with the requisite hot-pink accessories: glasses, watch and shoes. 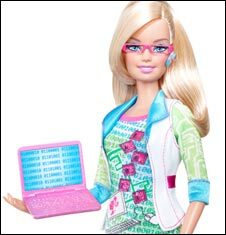 To emphasise her innate “techiness” she carries a pink laptop and sports a Bluetooth headset. No word yet on where the rest of us can get lime-green fitted tunics patterned with binary code. So disappointed. The threat to academic freedom and to free speech more generally is clear. The issue is all the more important when we, in the UK at least, are being pressured into ensuring that our research has economic and social impact. That such impact will be rewarded in the distribution of QR (research-related university funding) provides a clear incentive to universities to produce research that will be helpful to industry and government, and, correspondingly, to avoid research that is critical of those potential partners in ‘impact’. So says a recent study. I find myself wondering: if this is right, why is it that societies in fact work out the way that they do? There are clearly a huge range of factors that play out in the real world which aren’t present in the experimental setting. Does anyone out there know more about this research? This sounds fascinating and important. And the quote below offers a good critical thinking exercise too! A hundred years ago it was rarely diagnosed in children. In the intervening timespan the number and type of diagnoses have exploded. Moreover, the number and type of treatments have also exploded. The favored treatment usually involves powerful medications with serious side effects. Big Pharma has made a fortune from these medications and is constantly searching for new variations to patent and sell. I’m talking about childhood cancer, but I bet you thought I was talking about childhood mental illness. After all, everyone in contemporary society knows that childhood mental illness is over-diagnosed, that drugging children is the preferred method for dealing with the normal problems of childhood, and that normal children are being treated with powerful psychotropic medications simply because they are quirky and authentic. That’s what Judith Warner (author of “Perfect Madness”) thought, too, when she sold a proposal back in 2004 for a book that would explore the over-diagnosis of mental illness and over-treatment of children with psychiatric medication…[S]he came to write a book that is 180 degrees opposite of what she initially intended. It happened because she talked to parents and psychiatrists and looked at what the medical literature actually shows.